Not a happy bunny. Is the driver of this fine Ford Transit upset at the weather, his vehicle or both ? Swadlincote bus station has never seemed more alluring than in the fog of November 1987. On the Saturday before Christmas 1991, a big fog enveloped the South of England. Here, two Railair Link Berkhof/Scanias of Beeline are barely visible at Reading railway station. 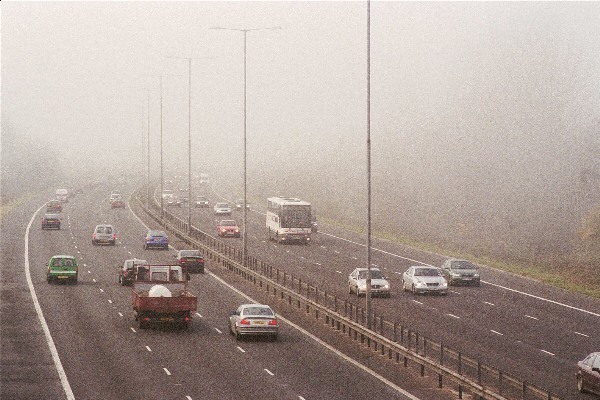 A Wessex Expressliner on a National Express service from Bristol to London, encounters some fog on the M4 motorway in November 2000. A Southern National Bristol VR and yet another Ford Transit 301 (C863DYD) in Weymouth in February 1998. Stevenson's 125 (XCW156R), a Willowbrook Spacecar, in Burton-On-Trent in November 1987.